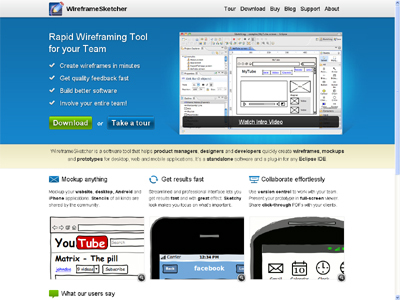 WireframeSketcher is a software tool that helps product managers, designers and developers quickly create wireframes, mockups and prototypes for desktop, web and mobile applications. It’s a standalone software and a plug-in for any Eclipse IDE. Fast and native user interface on all Mac OS X, Windows and Linux. So no Flash! Integration with many popular IDEs. The tool just becomes a part of the toolbox. Users work with a familiar interface and there is a low learning curve. The IDE already manages projects and provides support version control which is invaluable in a team. A standalone version for non-developers that are part of the team. An top-notch PDF export with high-quality vector graphics and text that can be selected&copied. It will make designers that use these PDFs very happy. HTML export that can be combined with Dropbox to make an online, clickable prototype that can be tested with any browser and also from iPhone, Android and iPad.